Last week I had the pleasure of playing a small part in recognising the important work that goes on across Copeland by local people, as part of National Volunteers Week. As the NDA Board member for Copeland Community Fund (CCF), I was invited in help present recognition awards to individuals and organisations who undertake a wide range of activities. So on Monday we were in Whitehaven and on Tuesday in the far south of the borough at Haverigg, and great evenings they were too. They were organised by both the Fund and the countywide organisation Cumbria Council for Voluntary Service (CVS), who both support and look for opportunities for volunteers. 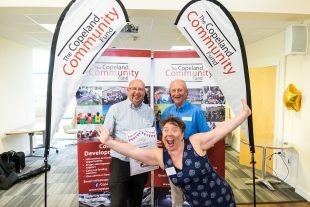 CCF is a community benefit fund that recognises the important role the Copeland community plays in hosting the national Low Level Waste Repository. We make direct grants to local organisations and support them through partners like CVS. We have also supported larger projects along with other local socio-economic funders. In fact over the last 6 years we have been able to award around £12million to 211 local projects which in turn has attracted additional match funding of around £19million! That money is making a real difference locally, and it’s always great to be able to see the results of the Fund’s support. Outside of work I personally support 2 local charities aimed at helping those with life limiting illnesses and that is also so rewarding. In fact what I came to discover last week is that whatever your interests - art, drama, sports, business - or if you are just keen to support your local community, there will be a local group that is just right for you and who could benefit from your time. So, if you aren’t already why not give it go? You certainly won’t regret it!